The skis have signs of wear & have a few marks but are otherwise in good used condition. Complete with 4.5 bindings. nordica skis team J Race 110 cm. Condition is Used. Bindings included. Basic starter boot. Well used but a bit of life in them yet. Nordica female ski boots. The boots are in good condition and very comfortable. Unfortunately I have damaged my back in the summer and have struggled to ski this year and decided to sell my gear. They can be collected from Colchester or sent via curries Size of boots is 38 Condition is Used. Dispatched with Royal Mail 2nd Class. Nordica ski boots GTS UK 8 size 27.5 I have had these for many seasons but are still in good condition, I have bought a new pair hence why I am selling.Condition is Used. Boys Nordica Skiing Boots Size 230-235 278mm. Condition is Used. Dispatched with Royal Mail 2nd Class. Very comfortable and easy for children to put on with children's sized boots. £50 when new. Nordica Grand Prix Ski Boots . Condition is Used (see photos for scuffs as you would expect from ski boots) Only used for a couple of seasons. Custom super feet footbed. Size 240-245. Fits uk 5- 6 ladies. Boot size 5 but I wear size 6 normal shoes. Dispatched with eBay delivery – Shutl 2-3 days. Concealed good with Velcro to back of neck. NORDICA ski kids Boots MOndopoint 17.5 (UK 11) Excellent First Ski Boots. Condition is Used. Dispatched with Royal Mail 2nd Class. Easy adjustable clip to do up. I have for sale a pair of skis. 160cm In used condition and would benefit from a service and waxing. Collection only although happy to parcel up if you want to arrange a courier for collection. Nordica Dobermann GP 110 ski boots size 27/27.5 315 mm with carrier bag. Worn for a week,some marks and scuffs shown on photos. Please feel free to make offers. For sale used NORDICA skis 170 cm with ROSSIGNOL bindings, in usable condition. SIZE 245 - EU38 - UK5. NORDICA GP TJ SKI BOOTS. Nordica Igniter Hot Rod ,123 76 107 R15 m 170. Hope that is helpful. The Bindings are Nordica X3i CT model. The information on the skis is as follows. Collection only. Perfect condition. Nordica Speed Machine 8 Ski Boots in very good condition. Flex index 100. Nordica GPX Ski Boots Mens Black Size Mondo 27 UK 8 US 9 322mm. *RCP Nordica GPX Ski Boots Junior Boys --------------------------------- These Nordica GPX Ski Boots are ideal for beginner skiers that need that extra support. They are lined with faux fur for extra comfort and warmth and have micro adjustable buckles. They also have a 25mm touch and close fastening power strap and are complete with Team Nordica branding. > Boy's ski boots > Soft lining > Micro adjustable buckles > Power strap > 3-piece design closure > Heat ready liner > Adjustable cuff profile > Flex adjust > Team Nordica branding > Upper: synthetic, inner: textile, sole: synthetic SBC 8-7 [Track Page Views With Auctiva's FREE Counter] (https://pages.ebay. Ladies Nordica Ski Boots. Condition is Used. Dispatched with Royal Mail 2nd Class. Woman's, ladies nordika ns 720 alpine/downhill ski boots, uk size 3 by nordika. Ladies Nordika NS 720 Alpine / Downhill Ski Boots, UK Size 3 by Nordika, are previously worn and still in good pre-owned condition. SIZE 235 - EU37 - UK4. NORDICA GP TJ SKI BOOTS. MONDO POINT - 28.0-28.5. SIZE -UK 9-9.5 EU 43.5 - 44. - MICRO FLEX. SOLE - 320 mm. CONDITION - Used. 8:00am - 15:30pm. NORDICA NR955 SKI BOOTS. SIZE 28/28.5 - EU44 - UK9.5. Nordica Ladies Black and Pink Ski Boot - Size 24/24.5. Worn approx 8 weeks and in good condition. Nordica Description: The 2018 Nordica GPX 105 W Ski Boot is an excellent women's boot from Nordica. This boot is for the expert all-mountain skier wanting one of the most high-performance women's boots available on the market today. The liner is Primaloft which ensure comfort and warmth. The 2018 Nordica GPX 105 W boot has a 98mm last with a 105 flex. It's built for the downhill with no compromises, designed for all mountain expert skiing. This is one of the ultimate Freeride All Mountain Womens Ski boots. They are a size 5 /5.5 UK (& on the underside of the boot say 240-245 which is the MONDO point size AND 285mm which is the sole length for fitting the bindings!). Here we have for sale my girlfriends ski boots in IMMACULATE condition. 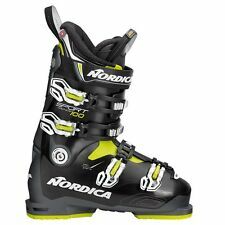 Nordica Beast Downhill Ski Boots. With Ski Boot Storage Carrying Bag. Size 7.5 UK. Size 25.5 / Sole Length 295mm. Which can be molded to your foot for extra comfort & Precision Fit. Sold as seen on photos in original Nordica bag and instructions. Used in Good condition, as son preferred freestyle, they have several marks as you would expect from that kind of use but were only used on one week of snow skiing and a year of dry slope use. Nordica Dobermann Team Ski Boots - Boys. BLACK /GREEN. VERY GOOD CONDITION. BINDINGS EXELENT CONDITION. Since we first introduced the Dobermann in 1999, a lot has changed, but not our classic four-buckle, 98mm performance shell, with a cork-fit, leather liner. So, what has changed?. Besides the new intuitive buckles, Weather Guard toe box, full-motion pivot and racing Zeppa, nothing much. Boot Sole length 325, Mondo size 28, Flex 160. These are for sale as part of a warehouse clearance. Si ze 4 la di es b oo ts adjustable at theb ac k as w el l as t he u su al f ro nt fastenings. 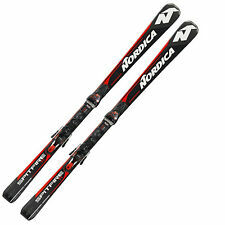 Nordica the beast skiboots. Good Condition used for 1 week with boot bag. Can be collected and tried on. These boots are used in good condition. Black Ski Boots. - Walk / Ski Setting. Sole length: 270mm. - Fit Tuner. Ski boots Nordica NXT W 95 - size 24.5 - barely used with new liners.